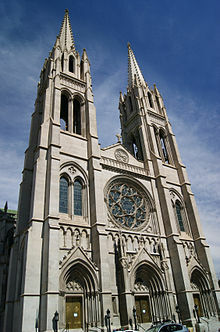 When I woke up and saw this picture that morning (see “I was Wrong about Harold the Doll Part One) I knew immediately that it was the Cathedral I went to Mass at when I returned to the Catholic Church almost 30 years ago. I also recognized the black thing surrounded by red as the bag that Harold has been in since 2013. It’s the same bag that Zak Bagans carried into the shack with the doll in it on the Ghost Adventures episode of the Island of the Dolls. To the right was Abaddon hovering over “Harold.” The “lightning bolt” was what Vincent typically drew to show anger or upset. I assumed that I was the one standing to the left of the bag. The “stars” above and to the right were the same sort of thing Vincent drew a couple of years ago when he drew a picture of the church his mother brought him to. They were inside the church when he grew restless and insisted on leaving. When he drew that picture he had the “black thing” outside the church, but the stars represented the “people in the church.” His mother told me that they were the only ones in the church at the time. But I had no idea what the drawing meant. I wrote a message to Jane asking her to ask Vincent for me. Since it was still late at night in Australia, I knew I wouldn’t be getting an answer anytime soon. “I’ll go to the Cathedral after she lets me know what this means,” I thought to myself. Since I knew I wouldn’t hear from her until that afternoon, and perhaps not until later that night, I even thought about not going until the next day (Friday). Suddenly, every fiber in my being screamed that I needed to go at that moment. So I did. I knew from past experience that there was a Mass @ 12:15 p.m. I also felt as though I needed to go to the Sacrament of Reconciliation. Because of the red in the picture, I thought a sealing ritual was supposed to be done on the bag. So that was my plan – go to Reconciliation, then the sealing ritual, and after that attend Mass. But I was running so late by this time I wasn’t sure I’d make it in time to do all of this. As I approached the church I was stunned to see it covered with scaffolding and some sort of mesh. I almost didn’t recognize it. I tried to open one of the doors but it was locked. I wondered if that’s why the bag, Harold, Abaddon and I were drawn outside of the church. That didn’t make sense, so I went in through a side door. “If this is really what God wants,” I thought as I entered, “He’ll nake sure that everything I need to do gets done. ” I have to admit, I was surprised to see that a priest was still hearing confessions, so I received the Sacrament of Reconciliation. One down, two more to go. Next, a sealing ritual was done on the bag. Two down. I said a prayer and then celebrated the Eucharist (from the Greek word meaning, “Thanksgiving”). I didn’t hear back from Jane until after I left the church and was heading back home. I thought about celebrating by breaking my Lenten fast, which I’d just begun the day before, and grabbing a bite to eat at McDonald’s. Something told me that I should just keep going. This (he points to the building) is where someone will help you. Not the first one you ask, but the other quieter man. It’s really not happy (points to the blob with the red around it). It’s trying to get things to be its friend and fight but it’s being stopped by the light (points to the big yellow star thing). Now he’s gone to get some toast. Even so, when I received absolution, I felt elated. A huge burden had been lifted from my shoulders. I felt free. The same priest who heard my confession also celebrated the Mass. I had the bag sitting next to me in the pew along with many of the pictures Vincent and drawn and painted so that when the final blessing was said, they would be sanctified as well. Within two minutes of me arriving back home, I received a phone call that was an answer to one of my prayers! “Thank you, Lord!” I yelled at the top of my lungs! I went from happy that this was over to ecstatic! Since then, every time I think about what came to me that night, a sense of peace washes over me; even though I’m personally not happy about it. I thought I was done with Harold the Doll after I left the Cathedral. I was wrong.